I got a Pickle…! | Bloom. ← The Very Hungry Caterpillar: The Untold Story. Last night we hosted a baby shower for a wife of one of Adam’s fraternity brothers. With the help of three of the other wives, it was a great party. It was our first time doing an actual, full meal for thirty people. And FOUR children. Yep, we are there… I learned that I need to invest in some coloring books and maybe even a little table. Yeah. So, two milestones this weekend: Big Dinner Party and Entertaining Kids. Thirty really is getting closer and closer. This morning the dust settled and everyone, including Adam, was gone. He had to run up to Michigan. I had to get dishes done and things to pick up, so I flipped on the TV hoping for a good Real Housewives marathon to serve as background noise. Turns out it was, apparently, amazing childhood movies of the nineties day. I “watched” a little bit of Home Alone 2, Liar Liar, Mrs. Doubtfire, and Little Rascals. Man. I love, love, loved Little Rascals as a kid. I HAD to have the pink, Princess Jasmine style PJ’s that the Olsen twins wore in the girl’s sleepover scene. My sister and I wore them proud. At the same time, of course. 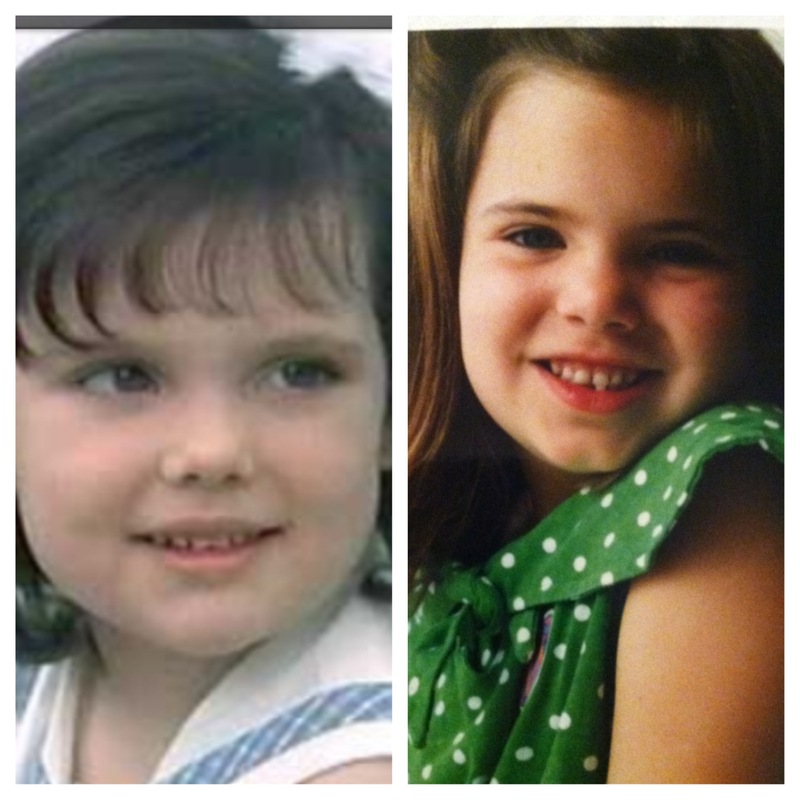 I even remember a family friend comparing me to Darla. Maybe? A little? Not so sure. And even at seven, I thought Porky and Buckwheat were so adorable. I mean, come on. They are precious. It was funny timing because I actually had that “I Got a Pickle” song stuck in my head this week. 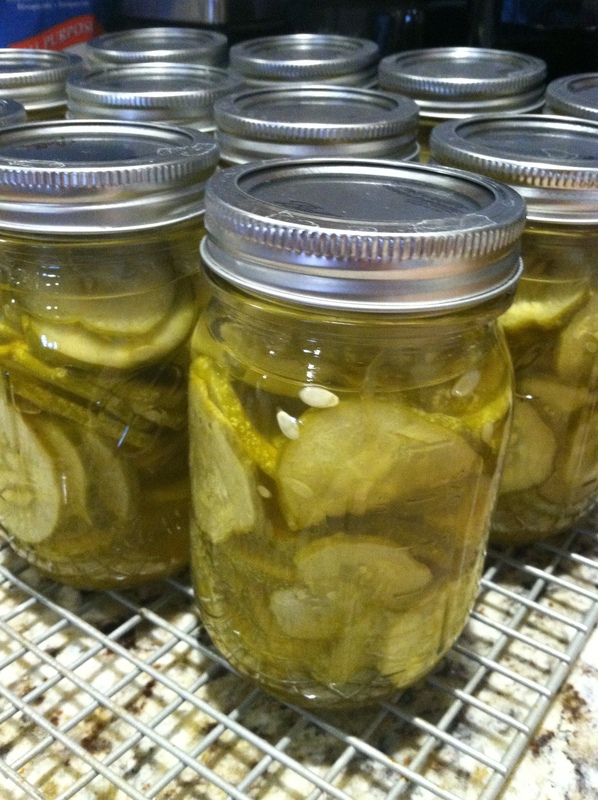 I took my first stab at canning, with the help of my Mother-In-Law and Sister-In-Law, and started with pickles. 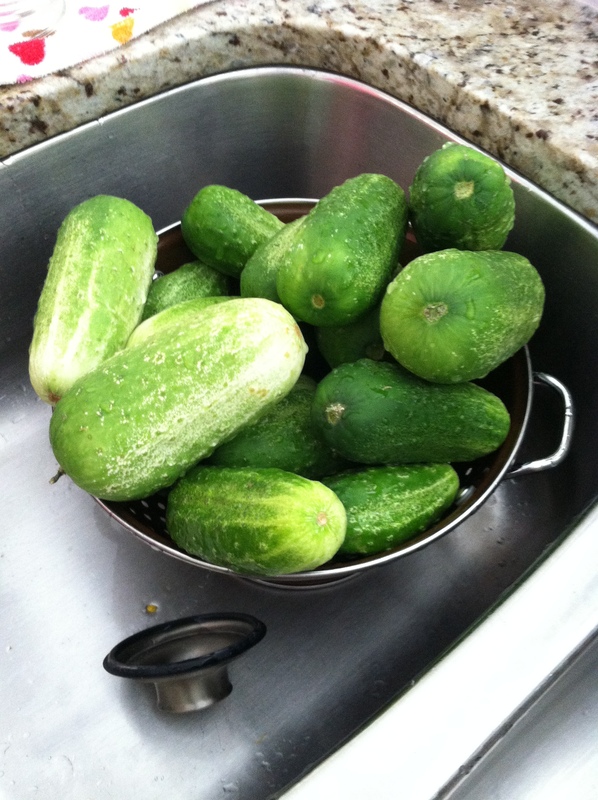 We planted pickling cucumbers in the spring and had been picking them for a couple weeks. 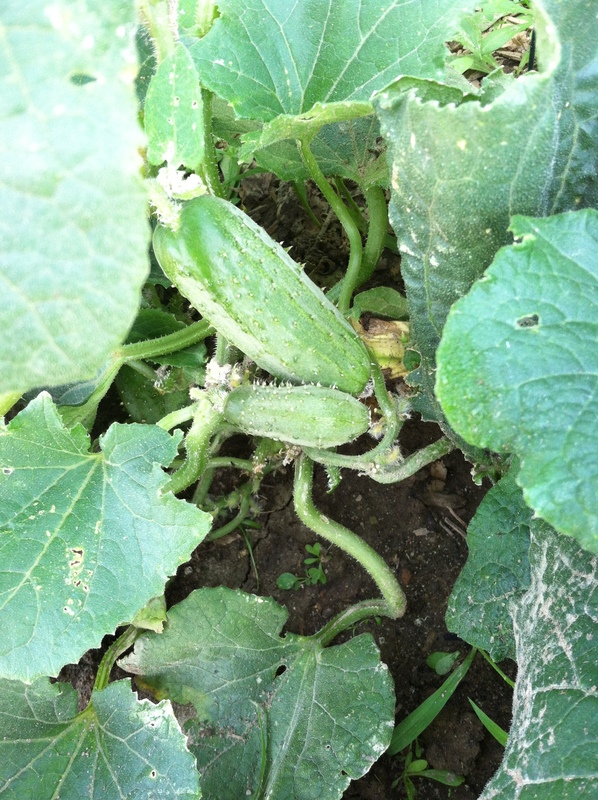 Pickling cucumbers are similar to regular cucumbers. They grow on a vine, but are much shorter, a bit fatter and a much lighter shade of green. We finally had about thirty so we were ready for pickles. 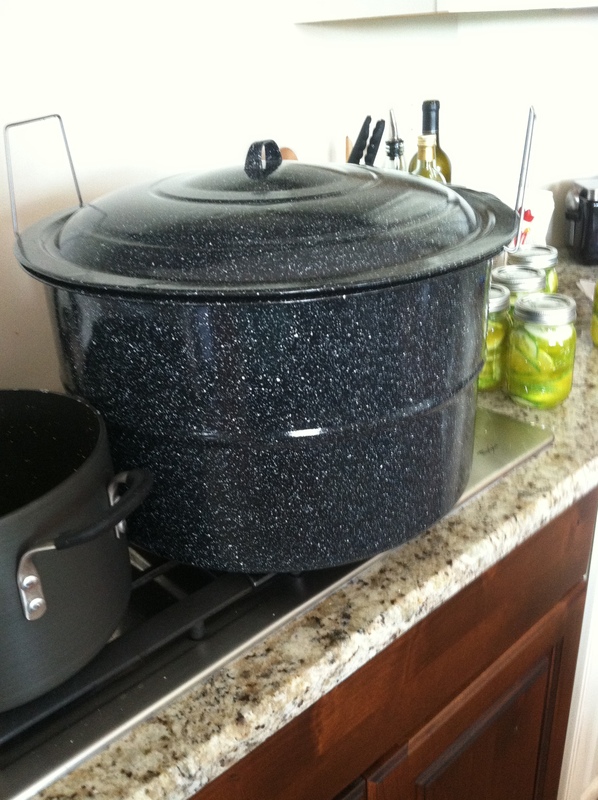 I have never canned before so it was a slight investment to get started. I bought pint sized mason jars, a water bath pot, and a canning kit (… I actually got this at Crate and Barrel on MAJOR sale last Fall) that includes things like a funnel, tongs and a jar lifter. I also picked up pickle canning seasoning packets because a few family friends recommend them and I was trying to make life easy for my first time canning. I chose a dill mix and bread and butter mix. Nancy, my mother-in-law, and Amanda, my sister-in-law came over after work last Thursday and we got busy. 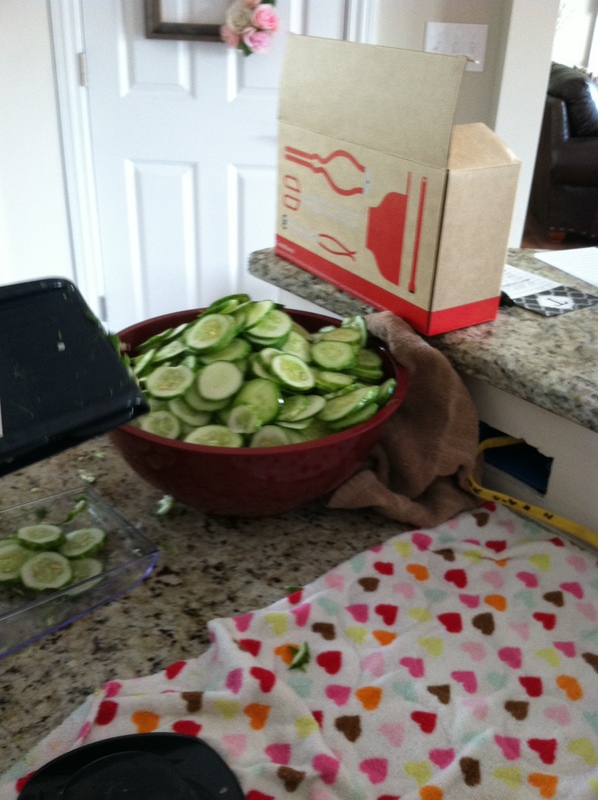 After slicing all the pickles on the mandolin, (Which, I, of course, did not escape without injury. I sliced my thumb. So, be sure to use that safety thing if you use one…) we had to wash the jars then heat them up with boiling water. You can do this two different ways. You can heat them in the water bath pot or you can pour in boiling water and then pour it out. We poured in boiling water. When I do this again, I will heat up the jars in the water bath so there are not as many things on the stove, I don’t have another thing to wash, and you have to get the water bath boiling for a later step anyways. Then we stuffed the jars with the sliced cucumbers and filled them with the seasoning that we mixed and heated up with vinegar for the dills and sugar for the bread and butter pickles. We filled the jars until they had a half inch left until the top. We were sure to wipe the rims and make sure there were not any air pockets in the jars before we put on the heated lids and screw bands. The BIG water bath pot. The full jars then went into the water bath. Both recipes called for the jars to be submerged in the boiling water for five minutes. When they were done we put them on a cooling rack so they could cool down and seal. We read that you should leave the jars alone for twelve hours. When the jars seal, they make a “pop.” Every pop, the three of us cheered as if we just found out the shoes we loved were on sale. A “Little Victory” as Amanda called it each time we heard a pop. Later that night, I found we had a BIG Victory. Every single one of our jars sealed. I finally gave a jar of dill pickles a try tonight. Dinner for me was a smorgasbord of left overs, so pickles fit in really well with the random things that made up my meal. I will admit; I was a little hesitant. I really didn’t know what to expect, so I smelled the open jar before I tasted them. They smelled just like dill pickles. I grabbed a couple slices and, sure enough, they tasted just like dill pickles! The one difference was that they didn’t have that crispy, crunchy texture that pickles from the store have. 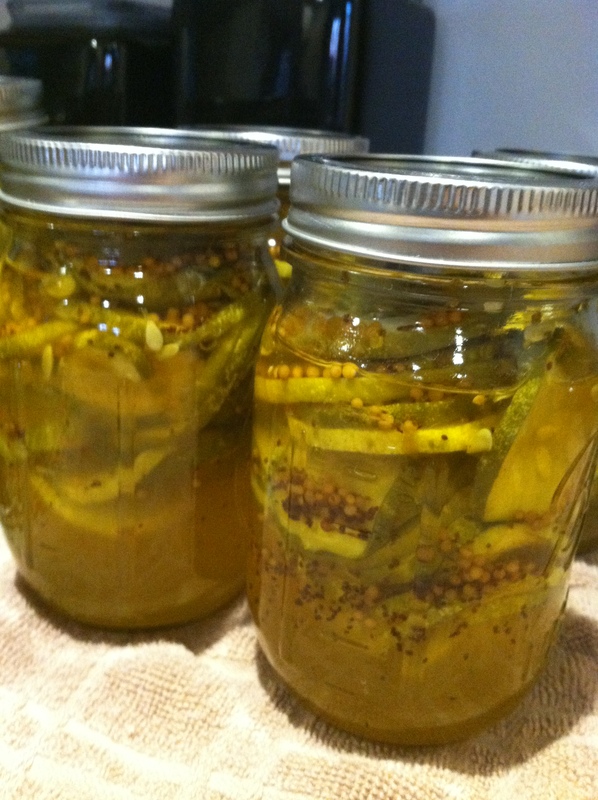 I love that about pickles, so I reached out and read a few blogs. Sounds like I let my cucumbers get to ripe. A lot of what I read said you need to start with very freshly picked pickles. I had mine saved up so I could do one big canning day. Lesson learned. Next time I will do the pickles in smaller batches and try to get that crispy, crunch. Do you have any tips or tricks to get crunchy canned pickles?